I was driving around lost on a windy Saturday looking for a softball game and I came across a JV baseball game between Kaufman and Wills Point. I stuck around for a little bit, taking a few pictures, then went on my way continuing to being lost. They have a nice field in Wills Point. Saturday morning was the Mardi Gras 5K run in Richardson, TX. The race was fun, just about the right size, about 900 runners. I finished the 5K with my best time ever 33:23. This Saturday is the Dash Down Greenville. Last years Dash was my first 5K. I put up a link for the Fountain 5K to be held in Terrell during the Heritage Jubilee on April 16th. 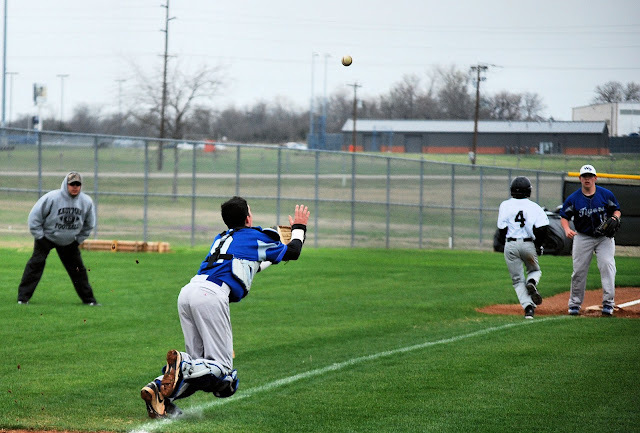 The Tigers baseball team finished the Jesse Cummings baseball tournament in Corsicana on Saturday with a win over Denison. The Tigers overall record stands at 4-8, 0-1 in district. These tournaments are perfect for preparing the team for district play. Last year the Tigers didn't have success early in the year but all of the games and experience paid off when they got into the district schedule. They have a district game tomorrow night in Waxahachie before heading up to Rockwall for the I-30 Classic starting Thursday. Thank you for the votes in the iHigh photo contest. I don't have a chance to make the top 5. Yesterday one of the photos added almost 4000 votes in 5 hours. That's 13 votes every minute for 300 minutes. I am sure the other photos will generate that many votes today. I'd like to know their secret. So, instead of voting for me, please visit the Terrell Tigers ihigh page at least once from each computer in your house or office. The Terrell booster club can get paid for unique visits to the site. My new favorite burger is from Five Guys. In and Out will have a tough time beating it. When you read something and its incorrect, do you make a point of saying something, or let it pass? If you see something I have written thats wrong or incorrect, please drop me an email.